It may be a little difficult to find but this is a top notch hotel. The service was prompt and attentive (I was even offered an umbrella for my afternoon stroll.). The rooms are spacious and our room had a great view of the river. 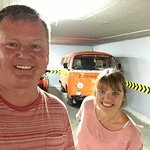 This was our first visit to Kosovo and our stay here gave us great introduction to this fine country. Everything were perfect. Hotel is nice and clean. Staff were friendly and helpful. They will help you to arrange any tour you want and will arrange transportation as most of the drivers in the country don't speak English. 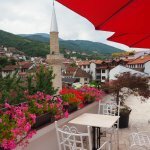 This very welcoming hotel offers cosy rooms, furnished with high quality and elegant equipment, in the heart of the Prizren old town, on the left bank. We had a wonderful and relaxing sleep, with the song of the water in the background. The hotel is located sufficiently away from busy café terraces. The building has a traditionnal architecture which is partly reflected in the rooms' design. The good breakfast is served on the roof top restaurant, which has a great terrace looking over the tiles of the old town - great to sip your Makiato. On top of this, the service was friendly and efficient and the hotel has an underground garage, for free at least when we overnighted there. The ratio quality/price is excellent. We loved the Classic Hotel. It is a truly beautiful hotel, a deluxe boutique property, with luxury at a 3-star price. The room was big and well decorated, the bathroom was big and well furnished. Breakfast was good. Service was very good.Location was good, except for the challenge of getting to and away from the hotel. The streets in the old city are narrow, and one way, so it can be challenging to find the hotel by car. Room tip: Ask for a room overlooking the river. 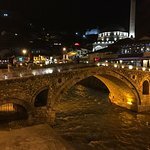 We were driving through the pleasantly crowded town of Prizren, road works on the other side of the river were keeping us on the towns east bank, it was pretty chaotic, when we stumbled across a friendly chap sat on a stool guarding the underground car park to the Classic Hotel. We squeezed down the ramp, somehow managed a 22 point turn and we were in. Very pleased with the excellent location, lovely view and wonderfully helpful staff. This Hotel is tastefully designed to reflect the Ottoman history of the city and the rooms are stylish and comfortable. Literally next door to all the main restaurants and cafes. Breakfast nice but simple- could have had a few more fresh selections of local breads, juices, fruit etc. but a fantastic view from the breakfast roof top terrace. My taxi driver says "this hotel is number 1 in Prizren" and I suspect he might be right.